A vibrating or shaky washing machine is a symptom of faulty suspension rods. The suspension rods in your Whirlpool washer model WTW4616FW limit the movement of your appliance’s tub. 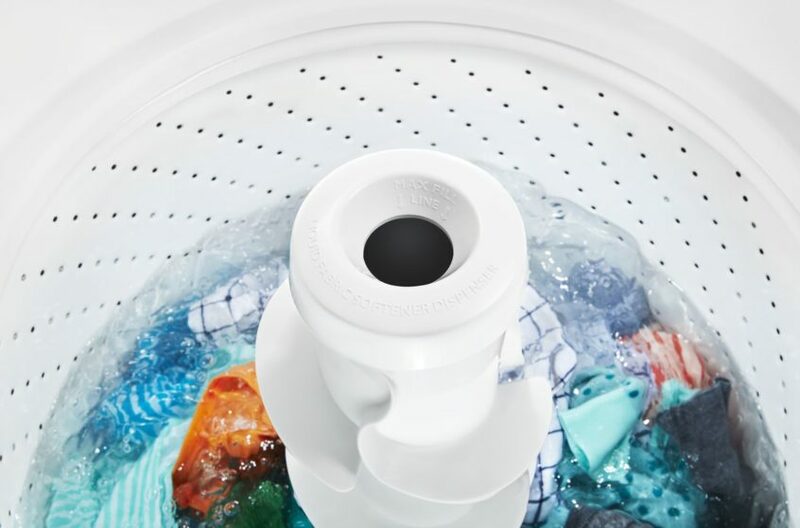 When one or more of the rods are damaged, the tub is no longer restrained, which leads to your washing machine shaking more vigorously than usual. Replacing the broken suspension rods is a relatively easy repair. Unplug your appliance before starting any type of repair. Safety goggles and work gloves should be worn at all times. Turn off the water supply running to your washing machine and remove the water supply lines from the inlet valves on your washer. Also, detach the drain hose from your appliance. Using a quarter inch socket, loosen the screws holding the tube guard in place and remove the part from your appliance. If you are not sure where the guard is located, please use your appliance manual as a reference. Tape the washer lid closed, and undo the screws holding the main top of your washer to the cabinet. Once the screws are removed, stand in front of your washing machine and pull the top forward to release it from the cabinet. Carefully lift the main top up and secure it. To avoid damaging the tub, place a towel in-between the cabinet and the tub. Use spring clamps to keep the towels from moving. Detach the ball supports from the old suspension rods by lifting the rods up and rotating the balls. After the balls are taken off, lower the rods and pull them out of the bushings. Hook the rear rods onto the back support brace. The front rods do not need to be attached to anything. Remove the bushings from their housing. Close the main top and reattach the screws you removed to secure the top in place. With the help of another person, tip the washer back so it is resting on its rear panel. You may want to place a towel on the floor to protect your appliance from damage. Now that the bottom of your washer is exposed, you can pull out the front suspension rods. However, to get the back rods out you will need to push the springs up to unhook them from the brace. Once they are unhooked simply slide them out. Insert the new suspension rods into the holes on the outer tub. Once again, you will need to attach the back rods to the rear brace. Return your appliance to a standing position. Remove the screws to the main top. Slide the top forward and lift it up. Install the new bushings into the support braces. Starting at the front of the washer, pull the suspension rods through the bushings and attach the new ball supports. After the new suspension rods are secure, remove the towels protecting the tub from damage and close the main top. Reinstall the screw you removed and take the tape off the washer lid. Reattach the tube guard, the drain hose, and the water supply lines to the back panel of your washing machine. Turn the water supply back on and plug your washing machine back into the outlet. If your washer is still shaking after you replaced the suspension rods, please contact us today and we can help diagnose and fix the issue before it gets worse.